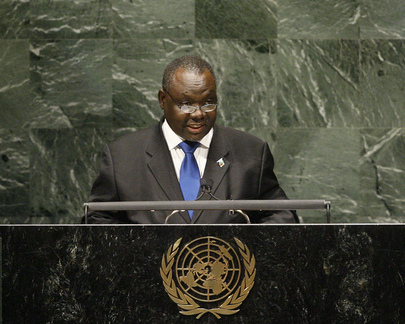 KALOMBO MWANSA, Special Envoy of the President and Minister of Defence of Zambia, said the General Assembly session was an opportunity for Member States to engage in a dialogue to find solutions to current challenges, in order to contribute to the socio-economic development and well-being of all people. The session’s theme reaffirmed the United Nations role and the need for that role to broaden its scope to cope with current global challenges. To reach the Millennium Development Goals, international partners must honour their commitments and ensure that the 2015 targets were realized. For its part, Zambia had adopted measures to boost agriculture sectors, and had invested in research and irrigation methods. However, the global challenge of combating land loss and ecosystem degradation required that all stakeholders step up efforts and meet the Millennium Goals and other internationally agreed development goals. He applauded the recent advances in the area of arms control and disarmament, but he lamented Zambia’s continuing battle to control the inflow of small arms and light weapons. The illicit weapons trade was retarding social and economic development, and he thus called for the establishment of a strong and legally binding arms trade treaty. He reaffirmed his support of reforming the United Nations, particularly the Security Council. Africa was without permanent seats and yet it constituted the second-largest membership in the United Nations. Zambia had addressed a number of issues, including integrating women in all sectors of society in decision-making positions concerning development, he said, adding that it had also addressed the issues of refugees. Sanctions imposed on Zimbabwe and the embargo on Cuba only hurt neighbouring States and their economies, and he thus urged that the sanctions and embargoes be lifted on both countries. Zambia, to strengthen its own efforts to consolidate democratic governance, was in the process of enacting a new constitution.